Puppies love to play and to chew and so do adult dogs. There are a lot of toys and treats on the market – how do you know which ones to try? We’re going to show you some of our favorites and explain why other toys and chews may not be safe. The three things to be the most careful of with toys are broken teeth, choking or swallowing parts of the toy. Bones, chew hooves and ice cubes should never be given to dogs as they are too hard. Even big dogs can break a tooth on a hard object, and in fact it’s the big dogs who love to chew that suffer the most fractured teeth. Even a Nylabone can be too hard. If you can’t flex a toy in its package, don’t buy it. 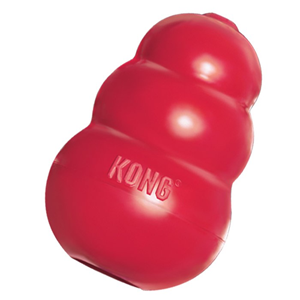 Rubber toys such as Kongs are sturdy and soft on gums and teeth. The blue ones that we sell are impregnated with a material that is visible on x-rays, so if a dog does swallow a piece of one, we can tell where it is in the body. You can hide treats or the pet’s regular food inside like a puzzle toy. This helps to occupy a puppy or dog when you are busy or going away. Rubber toys should always have at least 2 holes in them or a tunnel going all the way through. A dog’s tongue can get sucked into a single hole and create a vacuum that traps the tongue inside. There have been reports of dogs having to have their tongues amputated because they’ve gotten them stuck in a hollow rubber toy. Swallowing or choking on a toy are problems for pets just as they are for small children. The difference is that there are no government regulations for pet toys like there are for kids’ toys, so many toys are completely unsafe. Don’t buy any toy that has pieces that can come off or that you think might be destructible. Some dogs, especially small ones, will carry plush toys around and not destroy them but if your dog swallows the stuffing or the toy itself you could be facing a big surgery bill to remove wads of material from the intestines or stomach. If a toy is starting to come apart, take it away. Squeaky toys are OK as long as they are intact. Once they start to tear throw them away so your dog doesn’t choke on or swallow the squeaker. Squeakers can also cause heavy metal poisoning if ingested. Choose toys that are thick, sturdy and too large to get caught in the mouth or throat. Old, well-washed pop or milk bottles make good chew toys & are safe plastics made for humans. Frisbees are fine for large dogs. Old socks and shoes are not good choices. Your dog can’t be expected to tell the difference between new and old shoes, plus we’ve had to do emergency surgery to remove socks from dogs’ intestines. Tennis balls are great for playing fetch with dogs but put them away when you are done. The hair on the outside of a tennis ball is very abrasive to the enamel on the teeth. You don’t want your dog chewing on or carrying tennis balls around a lot because they will damage the teeth. Unfortunately, balls that come from pet stores are frequently contaminated with lead. Cheap pet toys from China are not food grade plastic and could theoretically poison your dog. You not only need to worry about what can break off & how hard the toy is but also about whether the toy itself is toxic. We haven’t yet heard of problems with rubber toys or rope bones. Rope bones are soft on the teeth & if they come apart the strings are small enough they don’t tend to cause problems. Rawhide chews can be toxic as well. Chews made in China or Mexico can have formaldehyde in them as a preservative but formaldehyde is a carcinogen and toxic to the liver. All kinds of by-product body parts, including rawhides, pig ears and bully sticks can be contaminated with salmonella or E. coli. You are at risk from these diseases too when you handle these products. 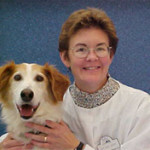 Rawhides can cause choking and if a dog swallows large pieces of them they can cause indigestion. Beef bones are only safe if they have been boiled for hours to soften them, otherwise they can cause both broken teeth and food poisoning. Chicken, turkey or other smaller bones can splinter and cause punctures in the mouth, throat, stomach or intestines, so these should never be fed to pets. Whatever toys you choose, use common sense and look for tough, long-lasting and durable choices. If your dog likes what you’ve chosen he’ll be sure to put it to the test!